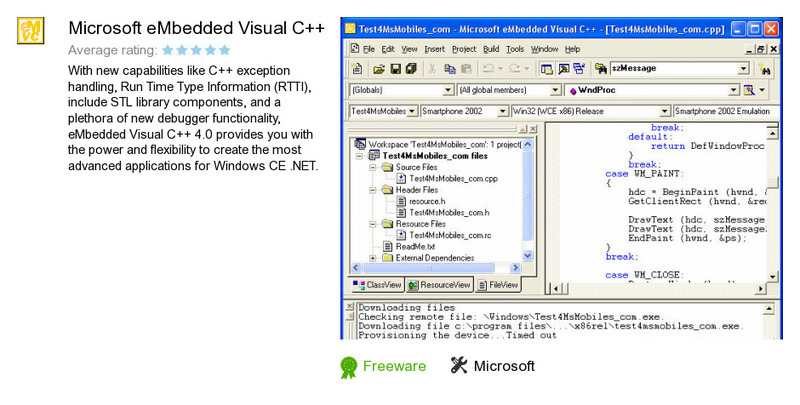 Microsoft eMbedded Visual C++ is an application developed by Microsoft. We know of version 4.0. Version 4.0.1631 is available for download at our site. Microsoft eMbedded Visual C++ installation package has a size of 235,075,098 bytes. It works with the following extensions: c, h, rc, cxx, bsc, vcw, vcp, tli, tlh, res. Microsoft also publishes Microsoft Exchange Troubleshooting Assistant and Microsoft ISA Server Best Practices Analyzer.